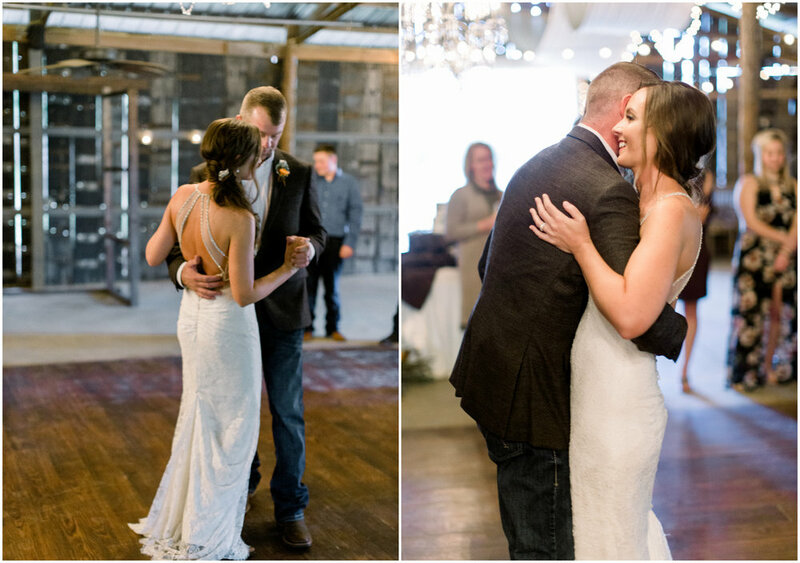 Couples from Kingfisher, Oklahoma apparently LOVE The Barn, and we always feel surprised, giddy and honored when another Kingfisher couple books with us! (There have been like five or six now, with another one coming in December?! Crazy!) 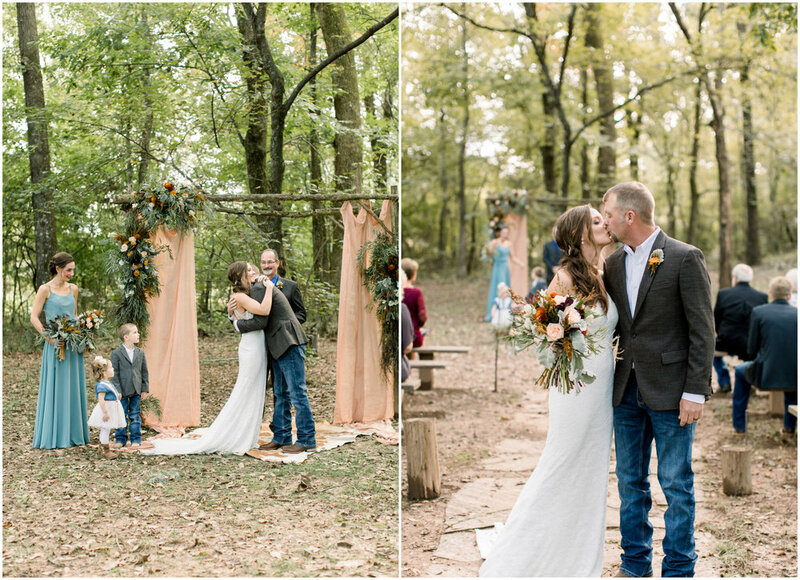 This sweet couple came from Kingfisher to tie the knot at The Barn, and it was the dreamiest fall wedding. 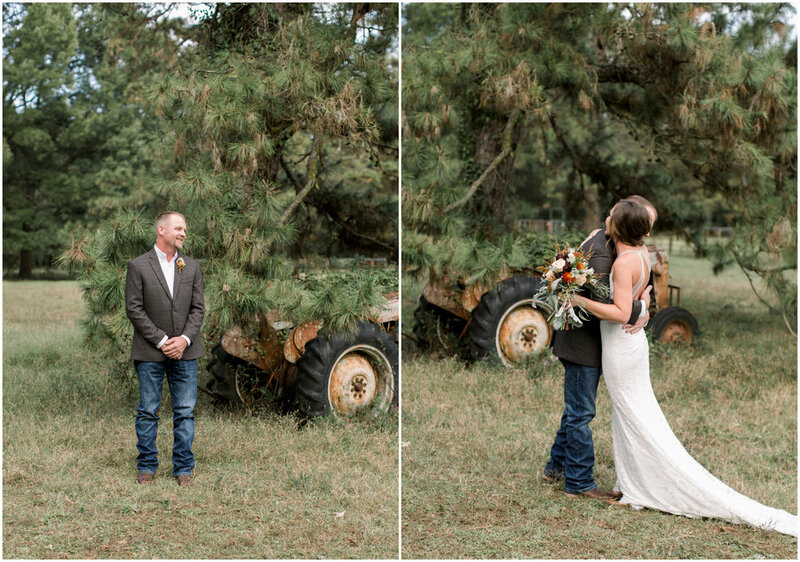 Their details were a little bit rustic and ideal for a ranch venue. They had an intimate ceremony and dinner with their closest family and friends, and it was truly the perfect day. 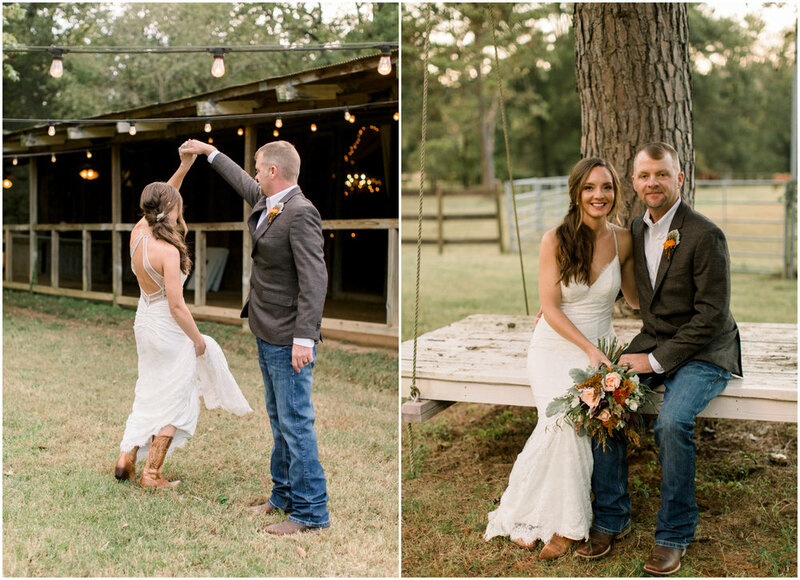 These photos by Crystal Malloy Photography are hands down some of our favorites of the year, and we can’t wait for y’all to see them! 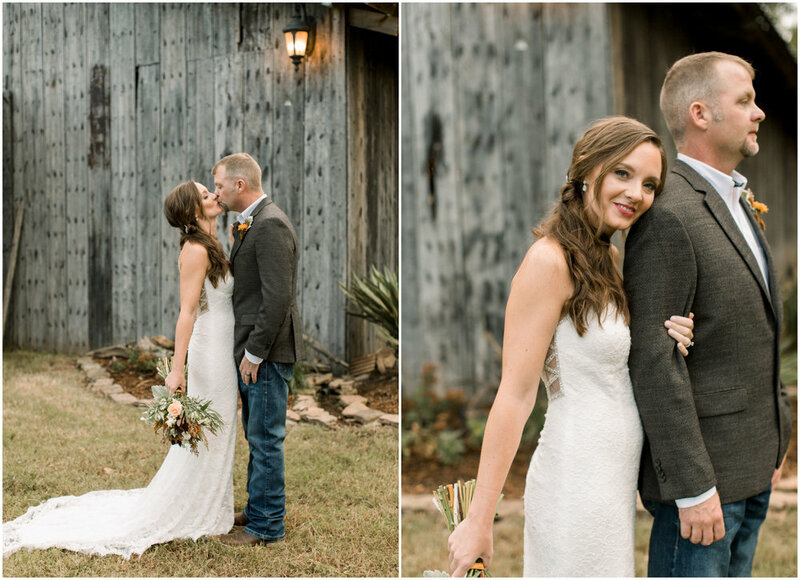 Amanda and Jon were married at The Barn at Twin Oaks Ranch on October 20, 2018. 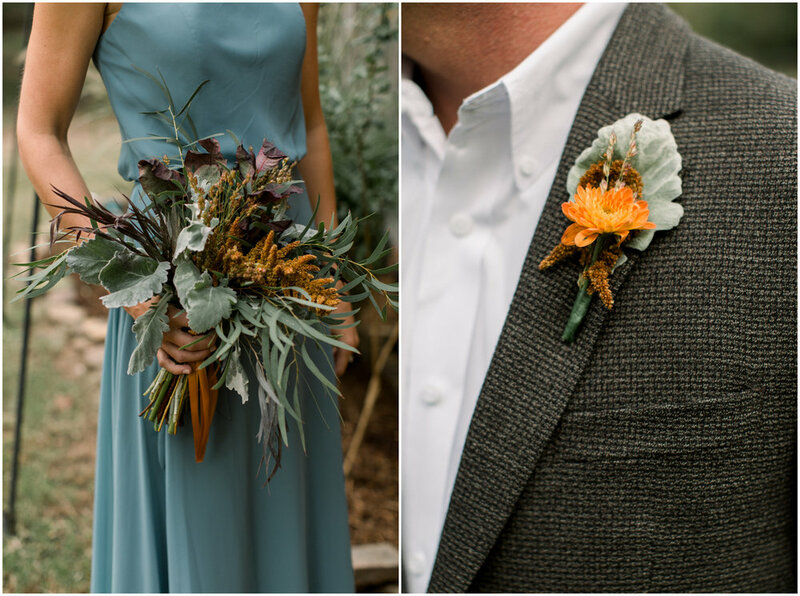 Their color palette was the ultimate palette for fall - they chose tan, burnt orange and sage green. 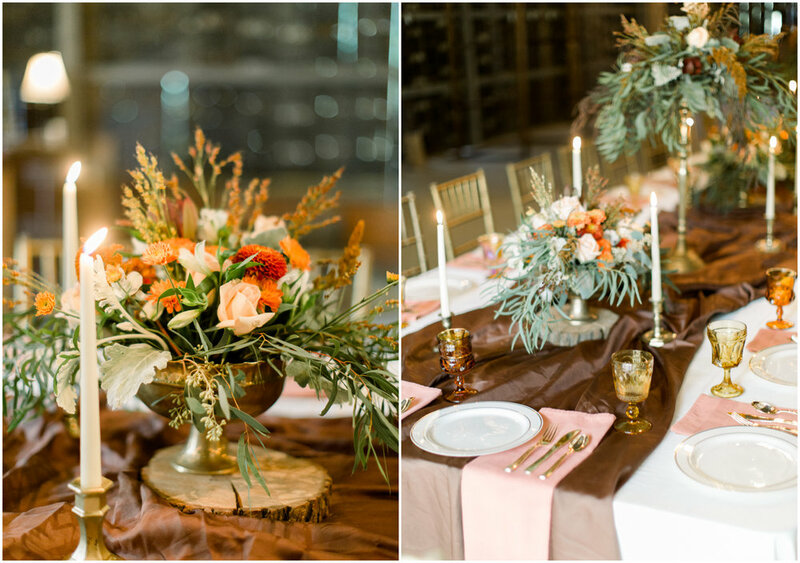 Their details were rustic and totally fall appropriate, with organic fall florals, earthy colors and wood accents. Amanda found her dream dress at Bella Rose Bridal. It was a simple lace dress with a fitted silhouette and a beautiful train, and my absolute favorite part was the back! The cutout was stunning, with just a touch of bling that kept it modern and unique. Amanda also wore the prettiest pair of boots (LOVE) and her great grandmother’s brooch in her hair. “My sister had also wore it at her wedding,” she said. You were such a gorgeous bride, Amanda! 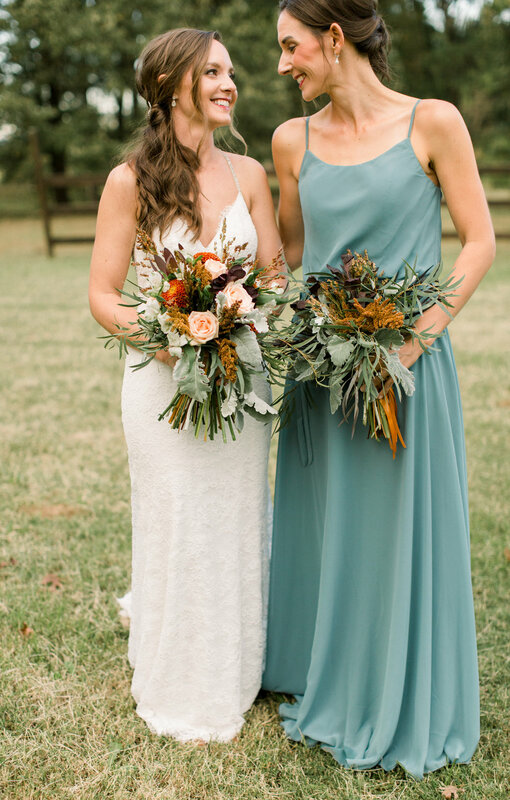 Amanda’s maid of honor wore a spaghetti strap, long dress in the prettiest shade of blue, also from Bella Rose Bridal. I truly love this dress! 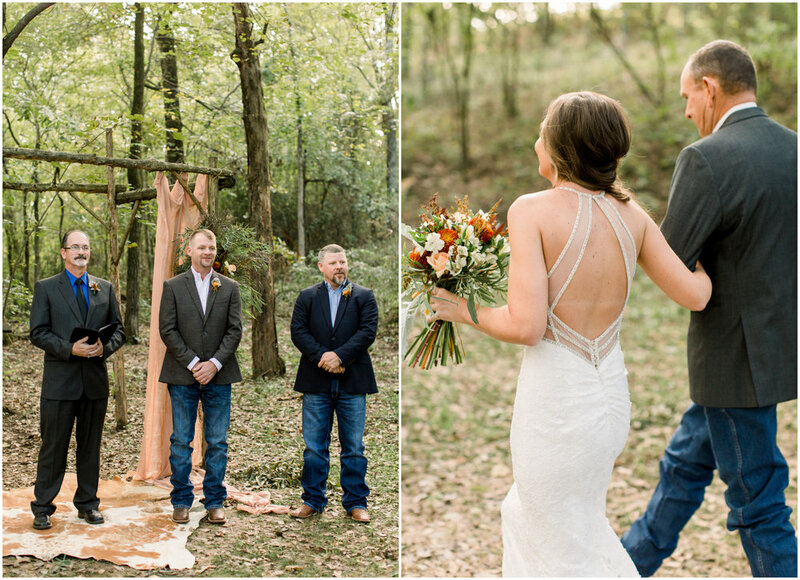 Jon, his best man and their handsome little ring bearer wore jeans, suit jackets and boots - a look that we love, and also the best look for a casual, rustic fall wedding! 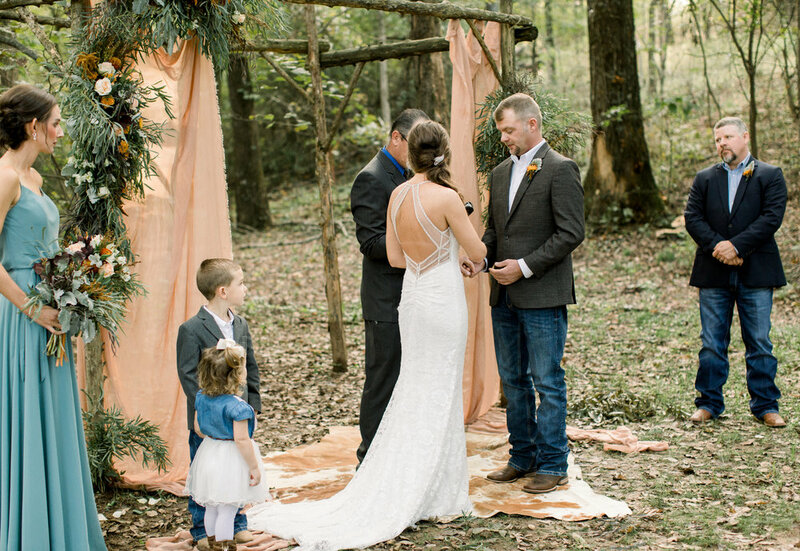 Their sweet little flower girl wore a denim shirt with a tutu, and she melted our hearts! Amanda said one of her favorite, most unforgettable moments of the day was her first look with Jon. It was so so sweet. “Crystal Malloy, the photographer, recommended doing this and I am so glad we did,” she said. 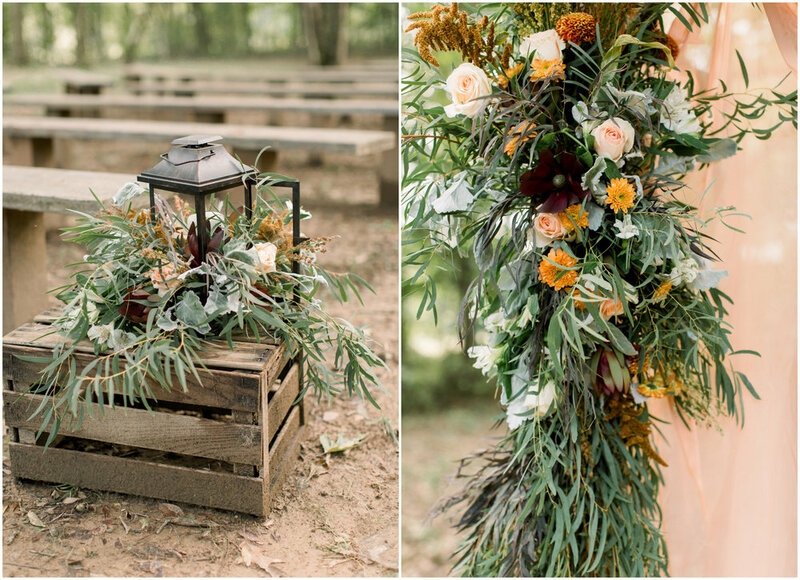 Amanda and Jon’s ceremony was full of rustic, ranch style details and pretty fall vibes. 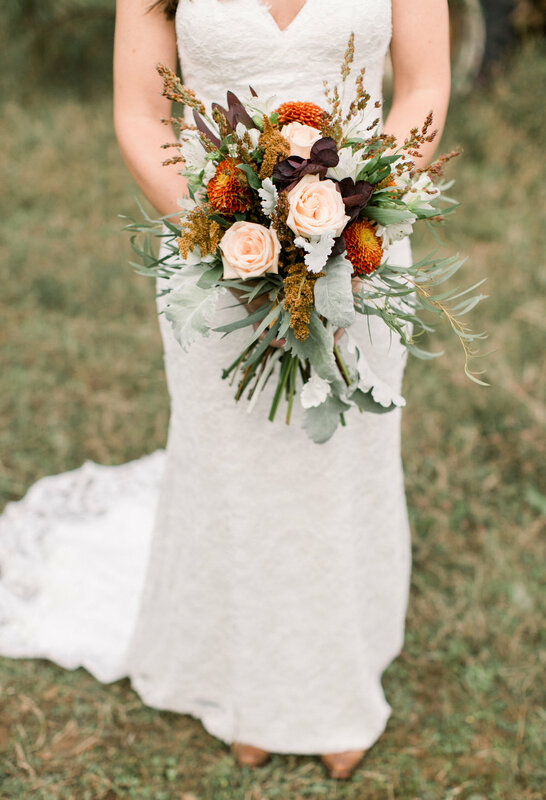 Their altar included a neutral drape and florals that matched the organic look of her bouquet - with loads of greenery and fall colors. The cowhide at their feet was the perfect addition. 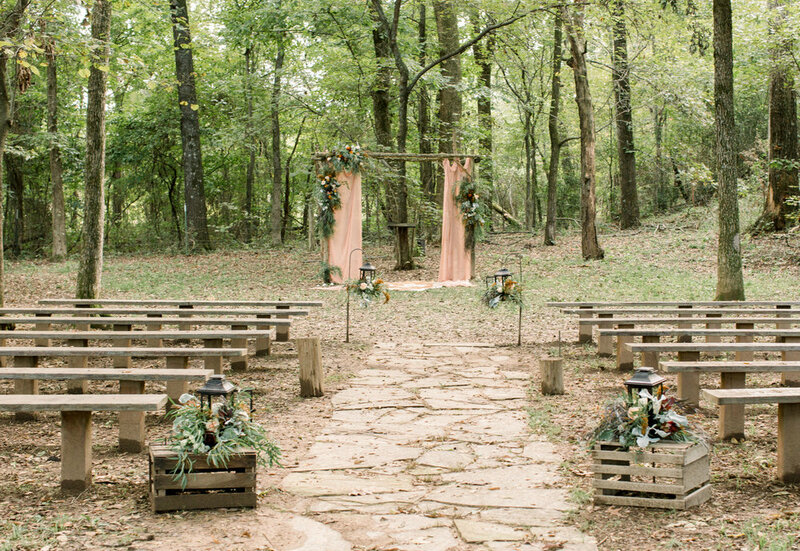 Their aisle was lined with a few wood elements, including wooden crates topped with lanterns filled with florals. And just because I can’t resist sharing way too many post-ceremony portraits, here are a bunch of Amanda and Jon, freshly married and looking all glowy and so very happy and in love! 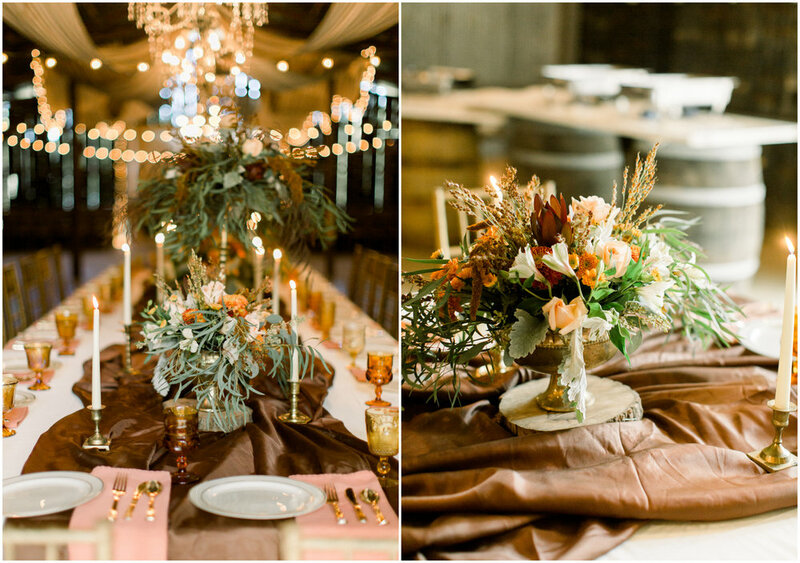 Amanda and Jon’s reception was like the dreamiest dinner party you could ever imagine. They kept their guest list small, so their dinner was very intimate and special. 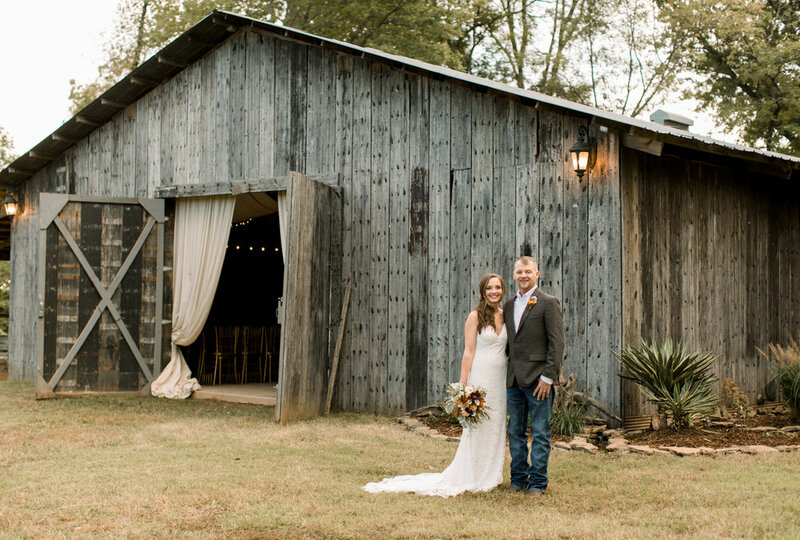 The twinkling lights and chandeliers inside The Barn made it extra magical! 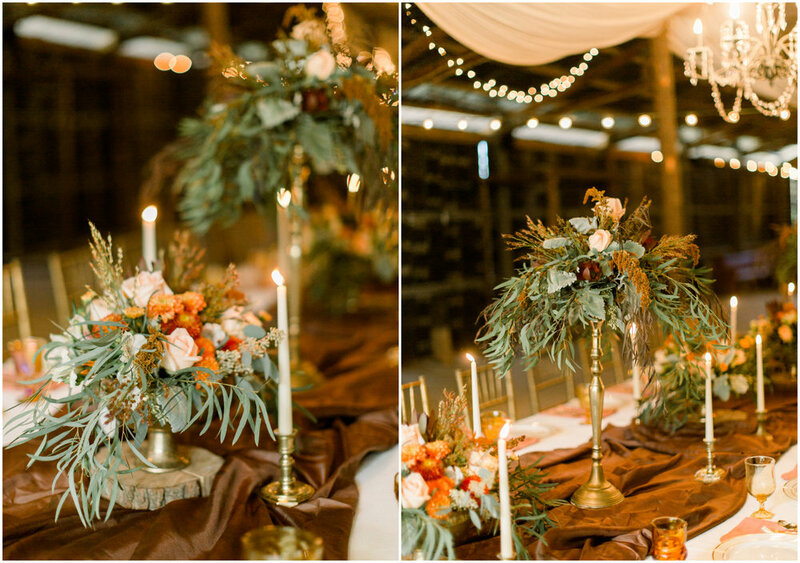 They had one long table in the center of The Barn that included a white tablecloth, a chocolate runner, white taper candles, brass candlesticks, and the prettiest fall florals in various brass vases set atop wood discs. Their simple place settings included pale pink napkins, gold flatware and vintage glassware. 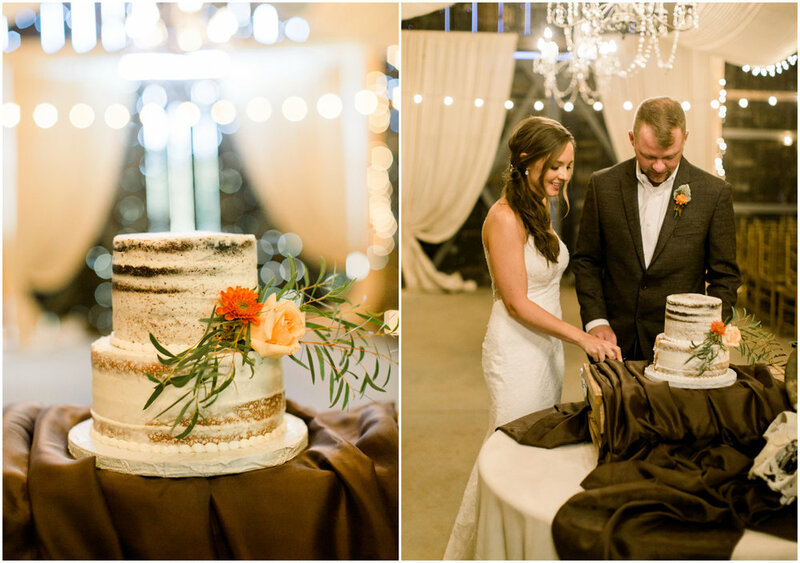 Their rustic, ranch style cake table had a steer head, lanterns, florals, and the cutest naked cake. They sent their guests home with some adorable koozies that read “loving you til the cows come home.” Precious! After their day was over, Amanda and Jon went on a mini honeymoon to Eureka Springs, Arkansas. They plan to go to Riviera Maya, Mexico for their big honeymoon in March!